Designer Christina Yao was able to look past an awkward layout to create the ultimate escape. When Victoria’s Secret designer Christine Yao was searching for an apartment, an awkwardly laid out bathroom (divided by a wall, with a half-concealed bathtub) made her pass on one would-be contender. The idea of renovating was just too overwhelming. But months later, she decided to factor the cost of a renovation into her budget. That original apartment was back on the market, and it seemed like a fortuitous match: Suddenly it had dream-home potential. 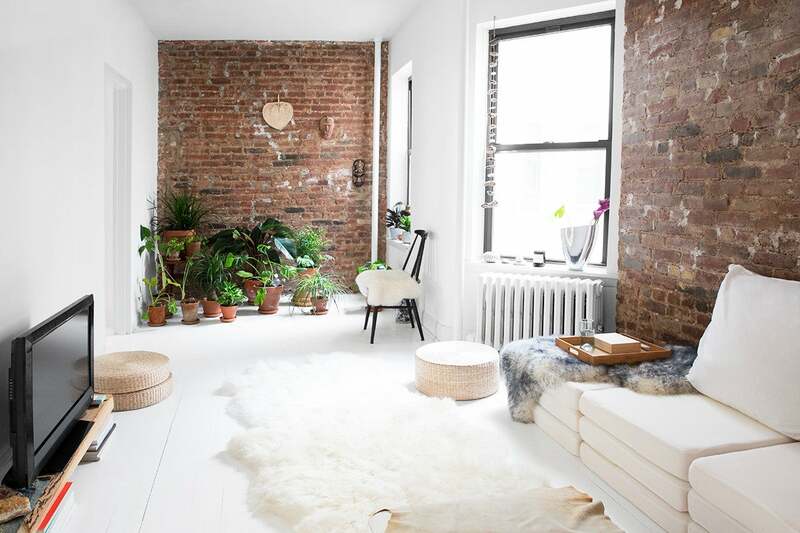 Yao opened up her home to us and shared the nitty, gritty details of her renovation. She started with her inspirations and ideas and turned to Sweeten, a free service match-making you with a perfect contractor for your project. Yao’s experience is especially helpful if you’re considering an overhaul in your own home, big or small—and we suspect after seeing the results of this designer’s renovation, you might feel motivated to do so. What would you tell people considering a redesign, and what’s the difference between a redesign and a renovation? Ask yourself if the space is adequate—can you fit your life and day-to-day activities? For example, the kitchen, main living area, and two bedrooms just needed a redesign. It’s amazing what fresh paint, removing some cabinet doors, and changing things out like lighting fixtures and doorknobs can do. But I couldn’t imagine my day-to-day in the previous bathroom—the door opening awkwardly and the dark shower, not being able to enjoy a bath. A renovation was needed. What was the renovation plan for the bathroom? I was hoping the center wall in the middle of the bathroom could be removed or partially knocked down. That was not the case, and after a lot of brainstorming and measuring, we went with a plan to completely rework the layout of the bathroom. How did the renovation process begin? I started actively using Pinterest for the first time. I asked friends for suggestions but I found Sweeten on the internet. They matched me with the contractor who had the most similar aesthetic as mine. What was your budget starting out compared to the final cost? My original budget was $25,000 for the bathroom and re-painting the apartment. The final cost ended up at $29,500. Why did the final cost exceed your original budget? I live in a co-op, and the process of getting permits and unforeseen issues with plumbing in between the floors increased the costs and timeline. A six-week planned renovation turned into three months. I think it was really just me underestimating the cost of labor and materials, especially here where I live. What do you think people should know as far as the time and effort that go into a home renovation? Be prepared for it to take longer than you think. And add another month. Be prepared to spend a good chunk of time every day on it—coordinating with your contractor, arranging delivery times, looking for fixtures, going to check on things, etc. Be ready to laugh when things go wrong. And go wrong again. It’ll be worth it when you are enjoying your renovated place, I promise. How did you achieve your dream aesthetic? I had so many images on my desktop saved for bathroom ideas and realized they all had the common thread of black tile floors and clean, white walls with modern fixtures. I was getting a lot of inspiration from restaurant and hotel bathrooms, since my toilet and sink were in a narrow line like many public bathroom spaces. I got ideas such as the recessed lighting above the toilet (dimmers are a must for all lighting—mood!) and exposed plumbing under the sink for more leg room. Let’s talk finishing touches. The greenery of the plants against the minimalist backdrop of your apartment really pops beautifully. When and how did you get the idea to turn to plants for a decor element, and why do you think it works so well? I have an image from a Terence Conran decor book I always went back to of a white-painted loft with white cushions and plants everywhere. When I first moved in a little over a year ago, it was right before Christmas. I got a big tree and single palm for the bedroom. After the tree came down, I missed the green and got a few plants. Then, every time I’d be out walking the dog, I’d pick up a new plant or two. The plant corner took over, and I put the dining table plans on hold. Dinner parties are now a floor affair with lots of cushions and trays for your plates and drinks. Plants make the room better! And I think with the white walls and exposed brick I’m lucky to have in this place, it makes a great background for them. What is your favorite part of your renovated home? The painted white floors! And, of course, I am so happy with how the bathroom turned out, too.